Poster for Ray Ventura film "Feux de Joie"
Indre Lluis, Robert Vez, Jefn Pirenee, Danny Polo, Louis Vola. - heavily cut from the 35mm cinema original running time of 95 minutes. A group of friends are in the forces and play in the military band. Once demobbed, they go their various ways in civvy street, not having much luck with their jobs. By a series of events they all meet up again and arrange to take over a hotel on the French Cote d'Azur. They cycle all the way there - we see them set off down (or is it up?) the Champs Elysee in Paris! Eventually by a bit of trickery the hotel picks up a few guests and becomes successful, with even some love interest on the way. Finale - reprise of "Y'A Des Jours, Où Toutes Les Femmes Sont Jolies"
In the late 1920's, The Lycée Jeanson de Sailly, in one of the smart areas of Paris saw a gang of youngsters - mad on Anglo-Saxon music, rather the sort of variety tinged jazz performed by bands like Jack Hylton's in the UK - form their own orchestra. The first records were cut in English. A member of the band, Paul Misraki, also wrote songs. The songs were full of refreshing humour that immediately caught on. To make themselves better known, the orchestra, by now 'Ray Ventura & His Collegians', hired the esteemed Salle Pleyel on a Friday 13th, a date no-one would book. The concert was a great success and as a result Henri Varna engaged the entire troupe to accompany Cécile Sorel on her debut run at the Casino de Paris. Soon the Collegians' songs were popular everywhere. By now the group could put on an entire show, including a mix of smooth and rhythmic vocal numbers, instrumental pieces and an assortment of gags and sketches. 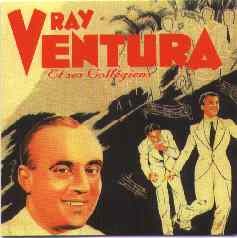 Ray Ventura had visited London for the first time in 1931, his group at that time including the American bass saxophonist Spencer Clark, although four years later he completely reorganised his band. In March 1938 he made a flying visit to England for a concert at the Odeon Theatre, Guilford, a broadcast the following day, and then a recording session for the Parlophone label. Personnel at the time included trumpeters Philippe Brun and Gus Deloof, trombonist Guy Paquinet, and bassist Louis Vola, the latter a long-time member of the famous Quintet of the Hot Club of France. Ray Ventura returned to England just prior to the outbreak of war. The war saw the Vichy government outlaw some members of the band. Most of the orchestra went with Ray Ventura to Argentina, South America, others remained in Paris with other bands. After the liberation, Ray Ventura reformed the orchestra in Paris, the bearer of new rhythms, he introduced the French to the delights of the samba. There was another successful British tour in 1946. By now Ray had also moved into film production. The arrival of rock & roll saw his retirement - Ray Ventura, who incidentally was Sacha Distel's uncle, died in Majorca on 29th March 1979.